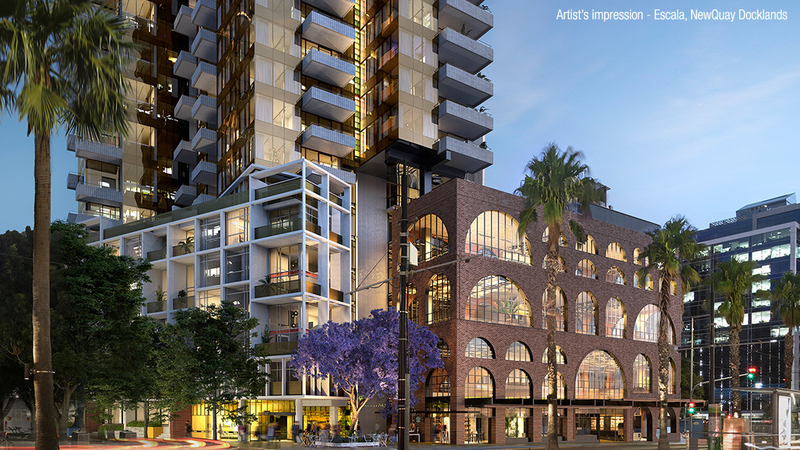 Developer MAB Corporation has announced the launch of its $130 million mixed-use development, designed to give residents in Melbourne’s Docklands a “self-contained work, rest and play” precinct. Designed by Six Degrees Architecture, the project, “Escala”, comprises a collection of four buildings offering residential, hospitality and commercial space in the eastern precinct of New Quay. Escala will include a 20-storey single tower and a collection of podium buildings over five levels in a T-shaped formation. The development will neighbour a newly-planned vertical primary school and AsheMorgan’s $150 million Harbour Town development. Less than a kilometre away, Chinese-backed Poly Australia recently announced it is looking for an anchor tenant for its 24-storey office development at 1000 La Trobe Street in the Docklands. Six Degrees Director Mark Healy said Escala’s design was to create a community which gave people reason to interact. “In Melbourne’s CBD, you don’t see cafes, shops, apartments and offices divided – it’s all a big melting pot which gives the city its buzz,” he said. Buyers are offered a range of urban living opportunities including apartments, lofts and three-level home-offices which were designed to respond to a new age of professionals who are looking for flexible living and work space. “We expect the variety of apartment sizes and shapes, not to mention the inherent flexibility of the loft and SoHo offerings, to appeal to young Gen Y’s and millennials that often work from home,” MAB Corporation general manager of residential David Allt-Graham said. There will also be a pool, gym rooftop garden and library to be shared by all tenants. MAB Corporation was founded by brothers Michael and Andrew Buxton, Escala will be the developer’s 13th residential development in Melbourne’s Docklands.